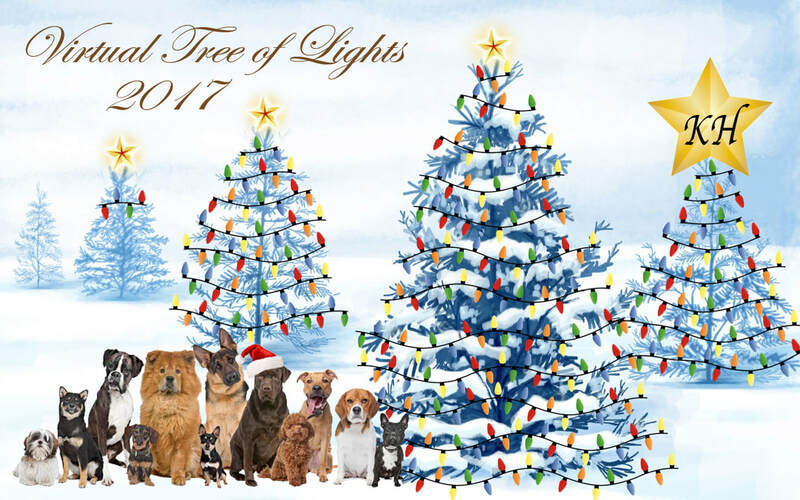 Please join us in our SEVENTH ANNUAL VIRTUAL TREE OF LIGHTS! Quincy K9 Connection volunteers and supporters live in Quincy as well as MANY other many communities. During the holidays and throughout the year, we often celebrate each other as we celebrate each critter safely reaching its forever home. At this time of the year, as we reflect on family, friends, and our beloved pets, it is appropriate to acknowledge that sometimes we need to express those reflections financially and unselfishly. Every week, our all-volunteer organization works endlessly to get animals out of high risk situations and into the care of licensed and approved rescue organizations. We do not receive adoption fees, therefore rely entirely on donations as well as money out of our own pockets to save animals each week! Often, we are contacted with situations where we must step in and cover costly emergency veterinary bills in order to save an unwanted or unclaimed animal's life when no one else is able to. ​Perhaps you will donate in honor of your own loved ones, two legged or four... or in honor of all the animals who were once homeless but are once again beloved pets. But please donate today! We’ve made donating simple for you. One light will be added to the tree for each $10 donation you make. You’ll have a warm glow in your heart for being part of an amazing rescue team; your own inner light will shine. Lives are being touched, humans and pets alike. Simply click the donate button to the right and be sure to specify that your donation is for the Virtual Tree of Lights. Also, let us know if your donation is being made to honor a special person or pet. Together we can light up the entire tree by CHRISTMAS! Nancy McAdam - Happy Happy Holidays! Babette Salus - In memory of Kate Hein, who loved all of the animals. **A big bright star has been added in memory of Kate, who poured her heart and soul into rescue. Megan Yancey - A light for Foxy and Pullo, the best snuggle puggle rescues out there! Elizabeth Wade - We appreciate all of the work you do, keep it up! Merry Christmas Robert Kashmer!! Leslie Trimble - In memory of Annie and Callie Davis, Salty Chase, Toby Foster, Pepper Holtschlag and to all who have lost their fur babies this year. Susan Styler - Thank you so much for the help you've given my family in the past and to the Plainville community. You do amazing work for the animals in need!